Win $100K For Your Startup? Does your startup want a shot at winning $100K? How about some 1 on 1 time with top startup mentors to perfect your pitch before you take that shot? How about filling the crowd with newly acquired Ontario startup friends to cheer you on? Among the many reasons to come on our Ontario Startup Train, there is new twist. 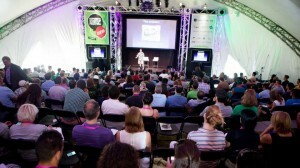 Twelve startups will have a chance to pitch on the main stage at the International Startup Festival in Montreal. Beyond being incredible exposure for your startup, you could win cash and prizes. Startups from our train last year won both the big prize of $100K as well as the FounderFuel Cohort prize. This year, we have the opportunity to select one of our on-train startups to be one of those twelve main stage companies! Once we select our company, we’re lining up one on one pitch coaching with some of the mentors taking the train with us. Our selected company will get time during the train trip with experienced startup mentors to help prepare them for their on-stage spot in Montreal. This is an amazing opportunity for exposure, improving your pitch and maybe even walking away with some cash. Our on-train mentors include Mark Macleod, who’s mission in life is to help fund, grow and exit startups and Alan Armstrong, who spends his days dissecting how startups are winning and losing their sales. Win our pitch event in Guelph on June 18. Win our online pitch submission, apply now! Yes, you should buy your train tickets first.